I have been getting interested in Polearms lately. After watching a video showing an A&A Knightly Poleaxe's haft failing at the socket from a blow to a helmet, I l have been looking into different manufacturers of pollaxes and pole hammers and polearms. There are a number of them in Europe that I have found little information on. So... I am looking for people's views and reviews of replicas and manufacturers from Wulflund, Lutel, Arms and Armor from Czech, Windlass, Arms and Armor (US) Etc. I actually own those two. The Windlass poleaxe seems like a halberd on a short pole. The Deepeka is nice but seems like it is a 2/3 to 3/4 scale weapon. It is small. I actually own those two. The Windlass poleaxe seems like a halberd on a short pole. That's because it IS a halberd. A pet peeve of mine is the misuse of the word "pole" and "poll". Medieval weapon terminology is a lot easier to understand when one learns that we use some words differently today than they did at the time. A medieval hammer was a spike - what we would call a "pick" today. What we call a hammer today was called a poll at the time. The type of shaft is irrelevant - "poll" and "pole" are completely unrelated words. The etymology of poll can be traced back to a word that means "head" (hence the words "poll tax" and "election poll"). Sledge-like hammers were called "mauls". The word "mallet" literally means "little maul". The weapon on the right is a warhammer. The pick-like spike was called a "hammer" while the flat bludgeoning part on the back was called a "poll". This weapon was also called a "pollhammer" - a hammer with a poll on the back. Most hammers had much shorter spikes. 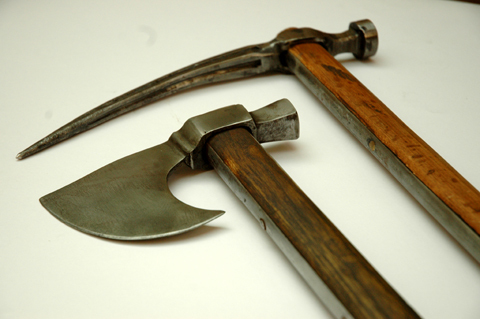 The weapon on the left was called a "pollaxe" - an axe with a poll on the back. Most weapons that are called pollaxes today should really be classed as halberds. If it doesn't have a poll then it can't be called a pollaxe. I included the word polearm to hopefully encompass the different terminologies attached to these weapons. The replications and manufacturers of these weapons are the focus of my investigation. I have seen the discussions about the names of these and hope this will not override my topic.